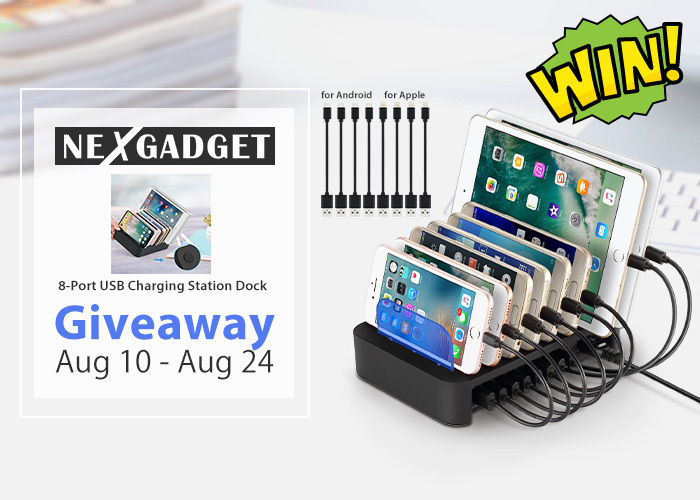 Giveawaybase has teamed up with Nexgadget to gift one of our fans with a brand new USB charging station! To enter in this giveaway log in to the giveaway widget down below and finish the tasks to grab your entries! No more adapters and messy cables,8 USB ports and 8 cables charge multiple devices directly. Ensures safe charging with built-in smart IC. Not only organizes your devices, and also charges them safely and steadily. Clutter-free cables with 8 perfect -sized charging cable,4 Miro USB cables for Android Gadgets and 4 Lightning cables for Apple devices. Enjoy neat and tidy desk even if 8 devices were charged at the same time. With 9 detachable baffles, easily to adjust width of the slots, hold your devices even they are in the cases. Not only charge phones, but also have enough space for tablet. Please note that the baffles glows when charging. Equipped with smart IC,which intelligently identifies and powers your gadget with optimized current. CE, FCC, ROHS certified. Provides surge protection, over-voltage, over-current and short circuit protection! Winner will be announced in the giveaway widget. Winner will be contacted by email and has 48 hours to reply to claim the prize. It is mandatory to like NEXGADGET on Facebook. The prize will be sent by NEXGADGET a few days after the giveaway end.